And I’m a sucker for wordplay, good or bad. I was raised on puns, on trying to outthink my brother and father, and later my sister, at the dinner table. To this day I can watch the three of them when we’re together, almost seeing the cogs working in those pun-machines, trying to eke out the least bit of humor from an off-handed comment. 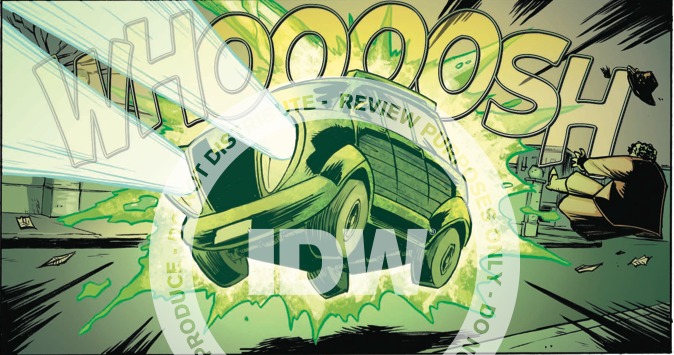 Monster Motors: The Curse of Minivan Helsing #1 hits plays me like a musical instrument. From the moment I heard the name, I knew it was something I wanted to check out, and this is one of those cases where judging a book by it’s cover (or rather by it’s title) was the best thing I could do. Written by Brian Lynch (Angel, Spike) this story is a slightly different take on the Abraham Van Helsing that was created by Bram Stoker in his classic horror novel Dracula. This Van Helsing spent his entire life in pursuit of the beasts that haunt the night. The obsessive nature of the character is brought to a head when he finds that all of the monsters have evolved past his ability to kill them. They’ve “gone metal”. Each of the creatures in this book have been transformed into a vehicle of some kind, and in turn Van Helsing has decided to put himself into a machine to better fight them. He didn’t choose a minivan, but that’s the form he’s got, and uses it to full affect. My first glimpse of this artwork happened because of the wonderful world of Twitter, where I found Nick Roche (The Transformers: More Than Meets the Eye) and his delightfully fun style. His characters designs are original and yet recall those Saturday morning cartoons that I mentioned above, with roots in Ralph Bakshi style animation. The colors provided by Leonard O’Grady complete that classic style that make me love this book so much, bright and vibrant. 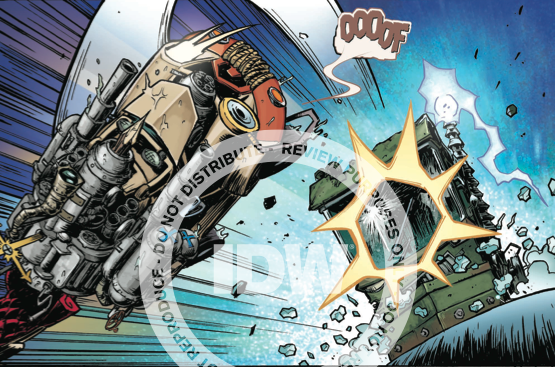 Monster Motors: The Curse of Minivan Helsing #1 is a beautifully drawn book that holds a super fun story. It hits all of those nostalgia points that I mentioned earlier without seeming childish or trite. This is Maximum Overdrive meets the Monster Squad. It’s the kind of comic I would love to create, and that’s why it’s a joy to read as well. This entry was posted in brad gischia, Comic Book Reviews, comic books, curse of minivan helsing, IDW, IDW Publishing, monster motors, review, small press and tagged Brian Lynch, comic book reviews, comic books, curse of minvan helsing, IDW, idw publishing, Leonard O' Grady, monster motors, Nick Roche, small press, Tom B. Long. Bookmark the permalink.